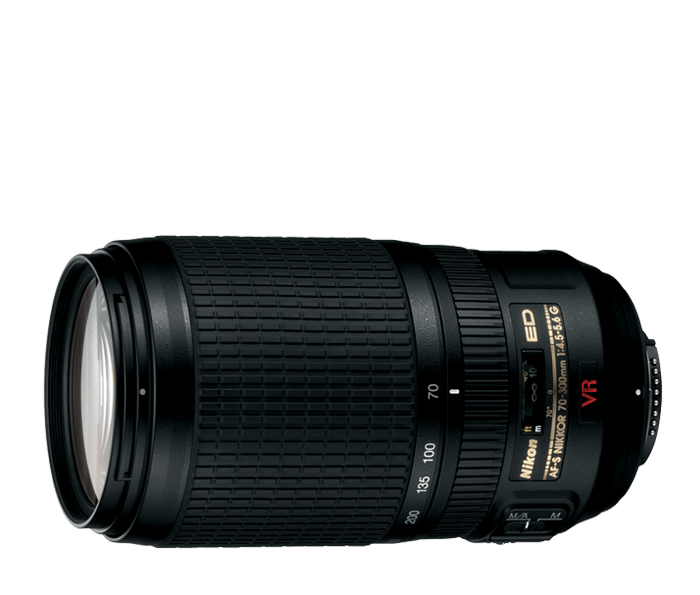 The AF-S VR Zoom-NIKKOR 70-300mm f/4.5-5.6G IF-ED brings telephoto reach to hand-held shooting opportunities. Compact and lightweight, it’s a well-balanced walk-around lens for stills and HD videos. Nikon VR (Vibration Reduction) image stabilization provides 2.5 stops* of blur free handheld shooting, assuring dramatically sharper still images and HD video capture. You can even focus as close as 4.9-ft throughout the entire zoom range for fantastic close-up shots. Whether you shoot an FX- or DX-format camera, the AF-S VR Zoom-NIKKOR 70-300mm f/4.5-5.6G IF-ED captures exceptional photos and HD videos with edge-to-edge sharpness. Its specialized Extra-low Dispersion (ED) glass produces clear, high-contrast images with minimal chromatic aberration. Nikon’s exclusive Silent Wave Motor (SWM) provides ultra-quiet, ultra-fast autofocusing with seamless manual focus override; and Internal Focus (IF) lets that focusing occur without the lens changing size, so you can maintain camera-subject working distance throughout the focus range.